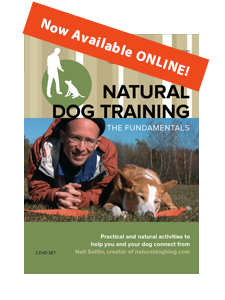 What is Natural Dog Training anyway? This should have been the article that kicked off the whole blog - instead it came later, and it's meant to be a summary of what Natural Dog Training is and why it's so great for ensuring you have the "happiest dog on the block". Play Tug of War with Your Dog, Let Your Dog Win, and Have the Happiest Dog on the Block. Tug-of-war is one of the most fundamental tools you have for becoming the center of your dog's universe. In this article I talk about the right way to play, why you SHOULD let your dog win (every time), and how to keep your dog coming back for more. What it truly means to be "calm" and "assertive" - Be the Moose in your dog's life. At the center of Natural Dog Training is the knowledge that our dogs are at their most focused, engaged, and SOCIAL when you tap into their prey drive. This article explains how the prey/predator dynamic is at work in your dog's life, and why it's important to be the moose - NOT the "alpha". Understanding how your dog feels the world. This article gets at the heart of our dogs' emotional experience of the world around them. You will learn about how a dog's emotions are at the root of all of their behavior, and how "problems" are really simply a matter of a dog's inability to physically relax at high levels of stimulation. You will have a fresh look at the way that your dog experiences the world, which is way more about the way they feel than it is about the way they think. How to Relax Your Dog. In order to teach your dog what to do when they're energized, FIRST you have to know how to relax your dog. This article teaches you specific techniques for relaxing your dog. It also will reveal to you some things that you might be doing with your dog that are...counterproductive. Using a REALLY long leash when you train your dog. We all want a dog who will behave perfectly when they're off-leash. The best way to teach your dog how to be off-leash is to give them the feeling of being off-leash to begin with! This article talks about the benefits of using a really long training lead. I also sell leads that are 50 feet long and made of one-inch wide nylon, in case you're having trouble finding a quality lead locally. Developing the Right Attitude as a dog trainer. Training your dog can be tough at times. It's an emotional experience for your dog, and it's an emotional experience for you. This article talks about how to stay positive, and how to see your dog's "problems" as opportunities for learning. How to "push" with your dog to tap into their primal prey drive and overcome their resistance to you. Pushing is at the core of introducing your dog to Natural Dog Training, so this is a lesson that you should NOT miss. With this technique you will learn how to attract your dog during their most energized moments, and you will learn how to resolve the most important question your dog is asking you: What do I do with my energy? Why pushing works - an explanation. This article describes why pushing works, and offers some additional insight into the process of resolving your dog's stress. Teaching your dog to come when called and Increasing your dog's attraction to you - how to play hide n' seek. In this article you learn how to play hide and seek with your dog, and how to use hide and seek to add passion to your dog's recall (i.e. "come"). You will be harnessing your dog's prey instincts, channeling them directly into the search for you, and you will notice how you're becoming even more moose-like in your dog's eyes. Play training that does it all: FetchTug! FetchTug allows you to reinforce your central position in your dog's universe, practice the recall, tap into your dog's prey instinct, and give your dog a great workout - all at the same time! How long will it take to train your dog? This is a candid discussion of how long it takes to train a dog. A quick tip on how much time to spend training your dog each day. Things to consider when you're thinking about getting a second dog. Why it's a good idea to keep your dog's paws on the ground. Giving your dog a place to be that's NOT on the couch or on the bed. If you find this site to be helpful, please consider donating directly to the NaturalDogBlog.